On October 1, 1978, a Baseball Glove indented in the palm by a heat embossing process by the name of "G-ONE-D" was announced by the late Kyozo Sasaki - founder and president of SSK. The dimple-processed palm created the ideal catching area for the ball and also enhanced the gloves conformation to the player's hand. The visual impact was sensational. 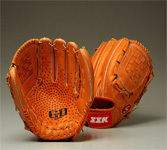 One million units of "G-ONE-D" series ball gloves were sold during a three-year span. This was a record hit in the history of ball glove sales in Japan. The "Dimple-processed baseball glove" was awarded a patent in 5 countries including Japan and the United States. Its unique visual design and functionality quickly made the SSK brand of ball glove very popular at trade shows in the USA. In 1980, SSK America Inc. -a wholly owned affiliate of SSK Corporation was established in Los Angeles and started marketing their baseball equipment in the US, Canada, Caribbean and European countries. A series of aggressive promotional activities including endorsement contract arrangements with a dozen big league players and a sponsorship program for competitive softball teams contributed to SSK's gaining a 4 % market share in the US in four short years. SSK started becoming involved positively in international baseball in the early 1990's. SSK signed official sponsorship agreements with the National Olympic teams of the Dominican Republic, Netherlands and Spain (the hosting nation) when the inaugural baseball games became a medal event in Barcelona in 1992. During these Olympics "The SSK Baseball Club House" was set up providing various services to officials, managers, coaches, players and the media, including the presentation of SSK products. The first SSK-IBAF Luncheon Party was successfully held, inviting baseball people from all over the world to promote better understanding and communications. IBAF (International Baseball Federation) selected SSK to be an official supplier of umpire equipment / clothing in 1993. Since the '96 Atlanta Olympic Games, SSK umpire uniforms and equipment have been provided and used at various International Tournaments, including the past three Olympic games. SSK is currently the official supplier of umpire equipment to the IBAF, Asian Baseball Federation and the Japan Professional League.